Why Should You Invest in Team Building? Your employees are the heartbeat of your company. It stands to reason that the healthier your employees are, the healthier your organization will be. One way to strengthen your team and improve engagement is to invest in team building. Team building is typically a series of exercises, activities and approaches that can take a group of individuals and turn them into an efficient, effective team. It is a great investment and when done correctly can be one of the most important one’s for your company. The best product or most innovative business plan means nothing if there aren’t great people behind it that work great together. Employee engagement is one of the most crucial elements of successful companies. It demonstrates how much employees care about the company’s mission and how hard they are willing to work to ensure the company succeeds. A Gallup study has found that “An alarming 70% of American workers are not showing up to work committed to delivering their best performance, and this has serious implications for the bottom line of individual companies and the U.S. economy as a whole.” Gallup has calculated that disengaged employees are costing the US economy $500 billion per year. While these are great reasons on their own, there are also huge financial incentives for team building. For example, a study by Kenexa of 64 organizations revealed that those with highly engaged employees achieved twice the annual net income of organizations whose employees lag on engagement. Team building can help you attract and retain top talent. Forbes recently wrote an article about how mega companies like Uber, Facebook and Salesforce are using team building to their advantage. Millennial employees are not only assessing their salary and benefits, but also whether or not they relate to the working environment and company’s purpose. Bridging the gap and differences in multi generations among your team can be challenging. Coming together as a team in a non-working environment can be meaningful in overcoming these challenges and retaining both long-term and new talent. MIT Human Dynamics Laboratory found in a study “With remarkable consistency, the data confirmed that communication indeed plays a critical role in building successful teams. In fact, we’ve found patterns of communication to be the most important predictor of a team’s success. Patterns of communication are as significant as all the other factors- individual intelligence, personality, skill, and the substance of discussions- combined.” Team building is one of the best ways to facilitate communication among employees, which could directly affect the success of your team. Enjoyable, fun activities enable employees to get to know each other and create a better understanding of each other. Team building activities should be orchestrated with a purpose of focusing on each person’s strength and what they have in common rather than their differences. Team building activities can be a powerful way to develop collaboration and trust and improve motivation to work together. Improving productivity is one of the most common goals of team building activities. Your policies and processes will have the largest impact on productivity. These are also greatly dependent on teamwork. You team will work more efficiently when they are motivated to work together more effectively and reduce duplication of effort. Team building activities can be a positive and fun way to encourage this with your employees. 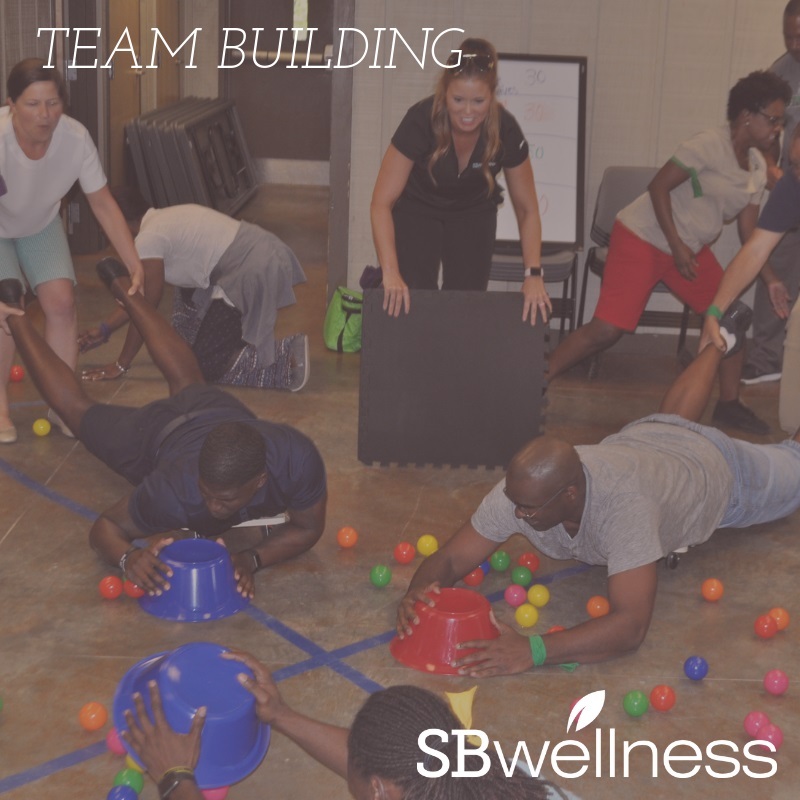 By investing in team building, you’ll help drastically improve your engagement among your employees, develop trust, calm conflicts, reduce stress, boost morale, and facilitate better teamwork in the office. You’ll also see returns in employee loyalty, innovation and work ethic. In short, team-building activities are a win/win for everybody. Your team feels appreciated, they enjoy a refreshing experience outside of the daily work routine. They get more comfortable with each other and engagement levels rise. All of this will increase workplace efficiency and benefit your company’s bottom line. 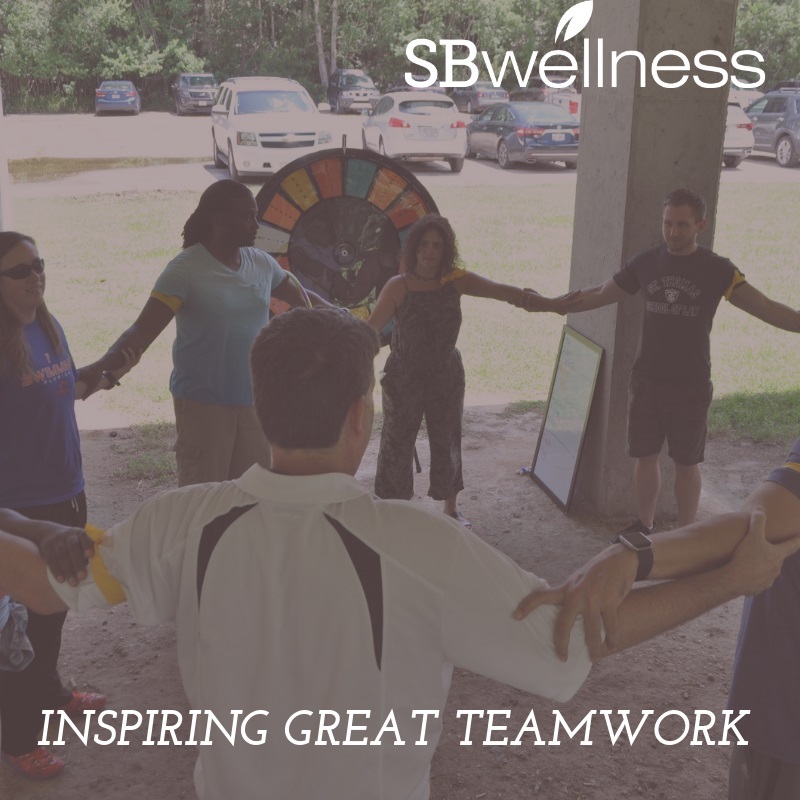 SB Wellness Group specializes in workplace wellness programming with over 25 years’ experience in the field. Our engagement and team building activities can be customized for your team or group. Contact us for more information on these and other services we offer.